Inside a guest suite at Hotel Kong Arthur, Copenhagen. Nikki Wallman searches for that elusive beast: a reasonably priced, stylish and spacious boutique hotel room in Europe. 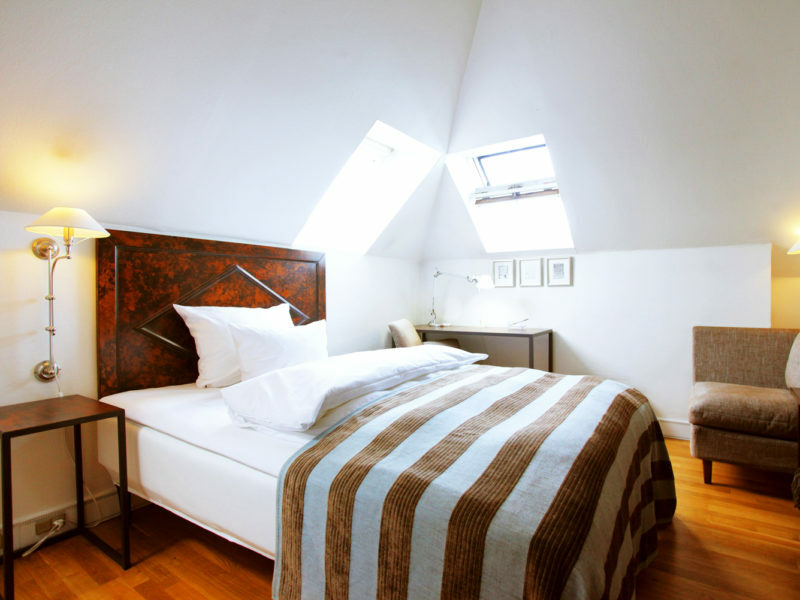 Searching for a fantastic boutique hotel room in Europe is kind of like deciding to date that dangerous, unpredictable, impossibly handsome man you discovered through an online dating site. Sure, it’s a tantalising prospect. Maybe you’ll get lucky – maybe he’ll be perfect. Regardless, you’ll see something different, have some adventures in the bedroom, experience a departure from the usual humdrum predictability (read: the local Best Western). But more often than not, it ends in tears. He doesn’t look anywhere near as good as he did in his online profile. You end up dissatisfied and feeling thoroughly ripped off. My point? 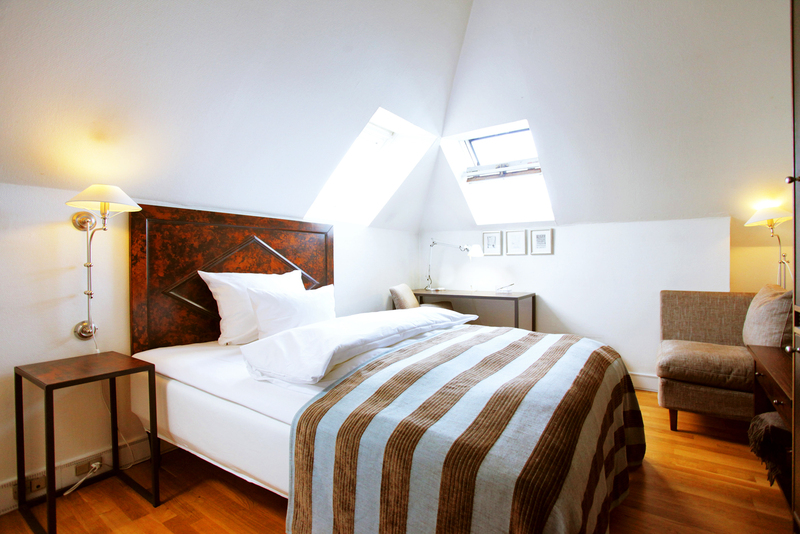 European hotel rooms can be totally unpredictable when it comes to the trifecta of being clean, comfortably sized and reasonably affordable. And so it comes to pass that I warily check in at Copenhagen’s Hotel Kong Arthur. I’m looking for something both cool and hygge (cosy) enough to live up to the Danes’ high standards in these fields. I’m also curious to see what a four-star, family-run hotel looks like in the world’s eighth most expensive city for tourists. The exterior of Hotel Kong Arthur. Housed in a building dating back to 1882, the Kong Arthur is nestled quietly down a cobblestoned lane off the main road of Nørre Søgade, which runs alongside the city’s gorgeous lakes. At check-in I’m handed a complimentary pass to the Asian-themed Ni’mat Spa, which will come in handy before my long-haul flight. My traveller’s shoulders immediately un-scrunch a little. The lobby, an L-shaped space surrounding a pretty central courtyard, is particularly cosy at night, with softly glowing lamps and a bar proffering the “world’s best G&T” using Geranium gin made by Danish gin maestro Henrik Hammer (if it ain’t the best, it’s damn close). With lots of couches, a gently crackling fireplace, a row of Danish shields lining one wall, and a real suit of armour standing near the bar, the area is cool, hygge and full of character – exactly what larger hotels tend to lack. Entering my room upstairs, I notice the sign hanging on my door. “Please do not disturb”, it asks, before reeling off a list of reasons: ‘I am writing my blog. I am contemplating how to make the world a better place. I turned off the light to save energy and fell asleep (the hotel is CO2-neutral). I am on Skype talking to my kids…’ I like a hotel that can make me chuckle. During my research, I found the Kong Arthur offers Standard Single and Doubles, which appear to conform to Euro standards of teeny-tininess. Opting for a Double Superior, I’m rewarded with a decidedly cat-swingable, white-ceilinged oasis of calm, punctuated by accents of sky blue and chocolate brown. A montage of simple, chic paintings decorates one wall, which I admire as I flop onto the comfy couch near the telly. The room strikes a good balance between homely and minimalist, with a few thoughtful touches like an ironing board neatly hidden behind the bathroom door, and a magazine rack stuffed with books and mags. The bed is insanely comfy. The bathroom falls down a little for me. It’s fine – clean and a decent size – but plastic cups, a weird bin that’s essentially a plastic bag attached to a large metallic peg, and a cheap-looking shower curtain are all less than I’d expect of a four-star hotel. The largely organic breakfast is served in a pretty, terracotta-tiled atrium overlooking the courtyard and includes dense breads, yoghurt and fruit cups with honeyed almonds, cold cuts, cheese, pastries (Danishes, of course) and a few hot buffet items. The picturesque courtyard at Hotel Kong Arthur. At Cozy Hour (5–6pm) guests can gather for a drink and snack relating to the season (mulled wine and cookies for Christmas; beers on Super Bowl Sunday and so on). I don’t have time to check out the three restaurants (Spanish, Japanese and Italian) but based on my first impressions, I wouldn’t hesitate to, should I return. And I probably will – this place is definitely second-date material. Nørre Søgade 11 DK-1370 Copenhagen K.
Location 8.5/10 – Right on the beautiful Copenhagen lakes and within easy walking distance to many hotspots. Style/character 8/10 – A great balance of the Danes’ trademark quirkiness and their elegant restraint. Service 8/10 – The helpful front desk staff is eager to please. Room 8.5/10 – Large, airy, comfy and cool: an urban oasis. Food and drink 8/10 – Breakfast was plentiful, fresh and yummy. We’re keen to try the Japanese, Spanish and Italian also on offer next time. Value for money 8.5/10 – The hotel offers great bang for your kroner in one of the world’s most expensive cities. The free spa pass was icing on the cake. Cost – Nikki paid $302 for a Double Superior room.